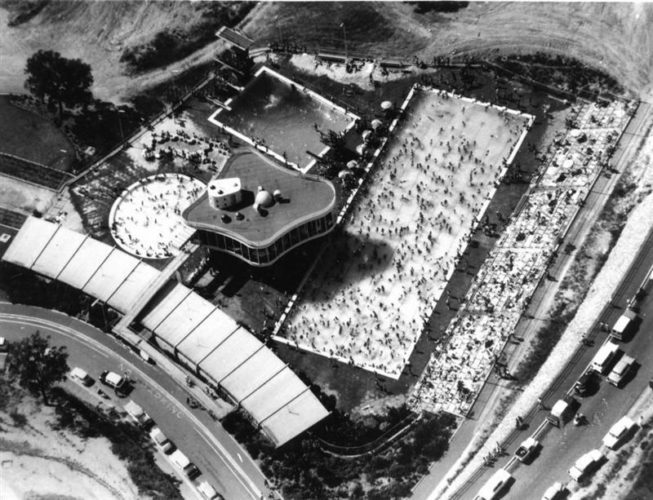 The free-form layout of the complex – pools punctuating the concourse and tower restau- rant floating above – was influenced by the sculptor Mans Arp and the Constructivist Moholy-Nagy’s posthumous publication, ‘Vision in Motion’ (I947). 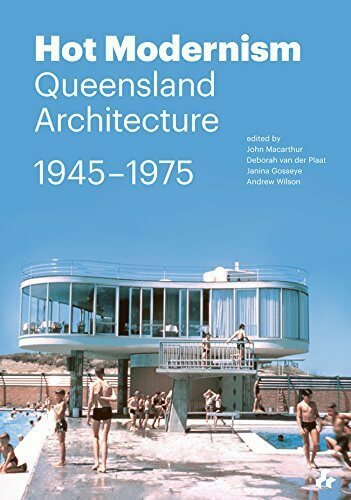 Birrell intended to generate a ‘festive air’ and in so doing, he echoed the work of Oscar Niemeyer; the tropical climates of Queensland and Brazil provide the perfect backdrop. 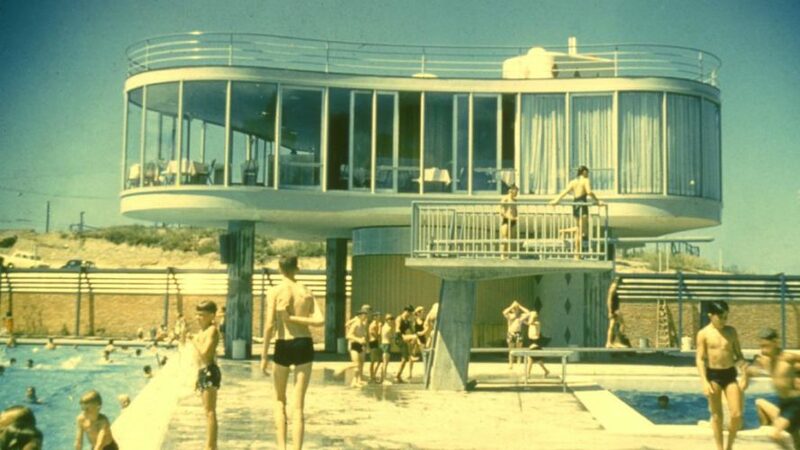 The restaurant and pools are of steel and concrete; the pool surfaces are covered in mosaic tiles, patterned in both geometric (main pool) and biomorphic (circular wading pool) designs. In form and function the Pools are one of the most direct adaptations of the Modern Movement to a singularly ‘Australian’ environment. 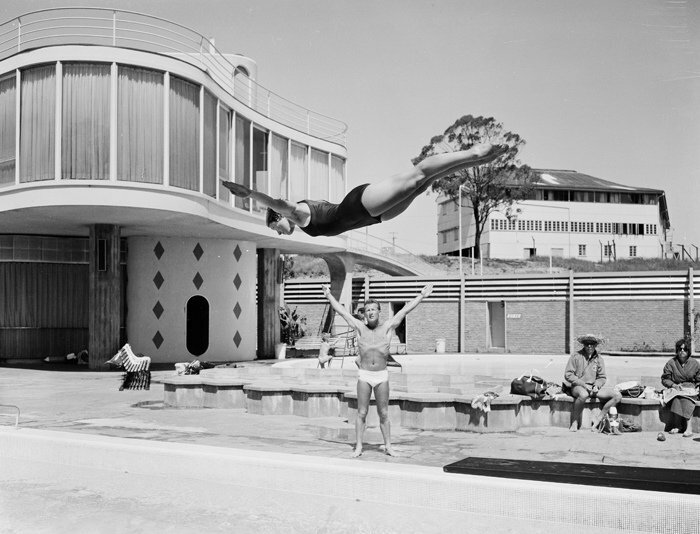 English-born diving instructor Steve Waring coaches Australia’s Commonwealth Games diving squad member Patsy Plowman at Brisbane Centenary Pool, 1962. 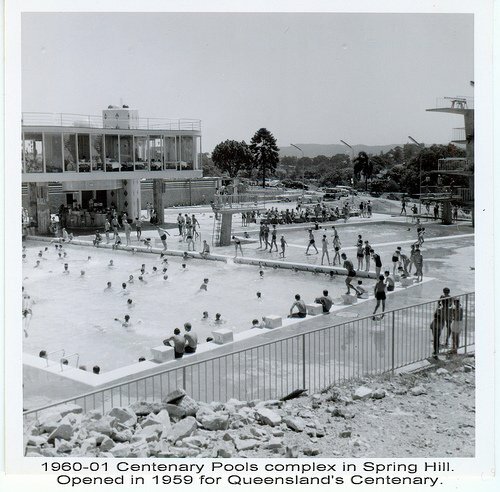 The pool complex, on Gregory Terrace, Spring Hill was designed by architect James Birrell and opened in 1959. This photograph comes from the collection of the National Archives of Australia. It should be cited as NAA: A12111, 1/1962/33/38.